Danny McDorman, Owner and Captain of OC Swim Call, is an Eastern Shore local and United States Coast Guard Veteran. 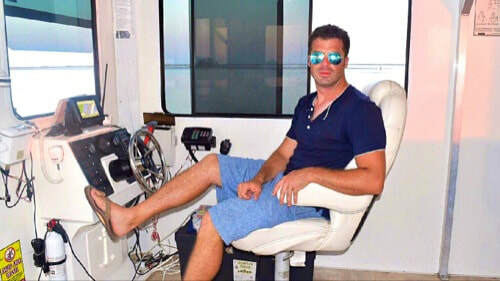 After serving for ten years on three ships and a rescue station in the Coast Guard, he decided to return to Ocean City, Maryland and create a unique party boat business that combines sight seeing cruises, boat rides, parties, and relaxation so locals and tourists can have a memorable experience at the shore. Why name it "Swim Call?" In the Navy and the Coast Guard, while underway, the captain would anchor the ship and announce "Swim Call" on the PA system to boost morale. Then all of the sailors would put on their swim trunks and jump over board for a good swim out at sea. Not only did we swim, we busted out the grill to cook up some steaks, hit golf balls off the bow, do some fishing, play games, and a whole lot more. Basically, it was just R & R for the crew. I just wanted to take a little piece of that experience and share that with everyone. So when it's your time on the boat, enjoy it the way that you want to!